Heat oil in a large saucepan. Add onion, bell pepper and celery. Saute (stirring occasionally) for 5-6 minutes then add garlic and creole seasoning. 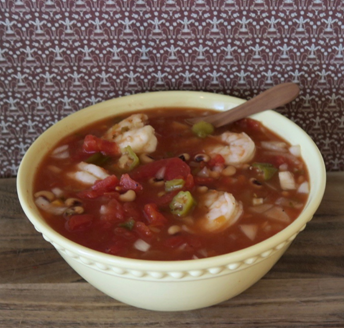 Cook an additional 2-3 minutes before adding tomatoes & okra along with black eye peas and vegetable broth. Simmer on low heat for 7-8 minutes then add shrimp and continue to cook for an additional 3-4 minutes. Remove from heat and stir in lemon juice and hot sauce. Serve gumbo over white rice or corn grits, if desired. Frozen shrimp is frequently on sale and very economical.